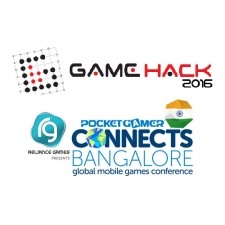 Pocket Gamer Connects Bangalore 2016 closed in style with the final results of The Very Big Indie Pitch. As was the case in 2015, the 2016 Very Big Indie Pitch also represented the final stage of Reliance Games’ pan-India game development competition Game Hack: a competition which looks to help support and grow India's indie development community. As such, this understandably meant that the games were all of a very high standard. “This year, Game Hack saw avid participation from Indie developers from across India and even parts of Asia. The jury was impressed with the quality of Indie developers and their innovative ideas. From arcade soccer shootouts, to a brand new social board game experience, all the way to a game hoping to challenge the giants of the eSports world, it was as hard as it’s ever been to narrow the shortlist down to a final five. All of which would battle it out for the winning the VBIP Grand Prize, which included $50,000 worth of marketing investments and $15,000 of cash prizes. In fact, it was so difficult that this year we actually ended up with a top six, consisting of The Light Inside Us, Wordifly, One More Pass, War Tanks, Monarchy, and Jhulo. All of which presented their games to a packed floor, and in front of national television cameras. Given the high quality of games on offer, it was understandably a difficult decision for the judges. However, as always there must be a winner, and this year the grand prize went to Big Boot Games’ brand new social board game experience Monarchy. All-in-all, Monarchy impressed the judges by offering gamers a deep and tactical board game: one filled with new and unique ideas. There was also a special mention for Wordifly too, who were worthy runners-up. Wordifly was chosen for not only the simplicity in its design, but also due to its gameplay that is both highly accessible and extremely addictive. That’s not all though for this year, as there were also two special prizes on offer. The first of these was the Blogger’s Choice Aware. This prize was deservedly awarded to Dastan Games’ The Light Inside Us. A title which offers a highly polished gameplay experience, one that blends puzzle, strategy, adventure and even shooting gameplay mechanics. The jury was impressed with the quality of Indie developers and their innovative ideas. This prize was chosen by some of Bangalore’s most prominent video game bloggers, who were invited to come and check out all of the 20 games just before the conference began. As such, this prize represented not only their feelings, but also those that they believe will resonate with their readers. Additionally, as always, there was also the People’s Choice Award. An award that is voted for by those attending the conference who were able to head over to the Indie Showcase, and grab a hands on with all of this year’s Very Big Indie Pitch / Game Hack finalists. Normally, this prize is awarded to one of the games that makes the judges’ final shortlist. However, this year that was not to be the case, and in a surprising twist, Paw Adventure by Skytoustudios walked away with the People’s Choice Award. A pet simulator inspired by titles such as Nintendogs. Ultimately, what was clear from both this year’s Very Big Indie Pitch and Reliance Games’ Game Hack is that there’s a considerable amount of high quality indie development going on in India right now.